Ajith Kumar G Post Graduate Scholar, Dept. of Manovigyan Evam Manasaroga, Shri Dharmasthala Manjunatheswara College of Ayurveda and Hospital, Hassan, Karnataka, India. Savitha H P Associate Professor, Dept. of Manovigyan Evam Manasaroga, Shri Dharmasthala Manjunatheswara College of Ayurveda and Hospital, Hassan, Karnataka, India. Suhas Kumar Shetty Head of Department, Dept. of Manovigyan Evam Manasaroga, Shri Dharmasthala Manjunatheswara College of Ayurveda and Hospital, Hassan, Karnataka, India. Kavyashree K Post Graduate Scholar, Dept. of Manovigyan Evam Manasaroga, Shri Dharmasthala Manjunatheswara College of Ayurveda and Hospital, Hassan, Karnataka, India. Keshav R Post Graduate Scholar, Dept. of Manovigyan Evam Manasaroga, Shri Dharmasthala Manjunatheswara College of Ayurveda and Hospital, Hassan, Karnataka, India. Prajnaparada (Intellectual Blasphemy) is willfully ignoring one’s inner knowing and going against norms, intuition and common sense. It is the root cause for all diseases. Involving in verbal, mental or physical activities which are un-favorable to self, harms both body and mind. Actions generated by Prajnaparada aggravate Tridosha (bodily humors) and stimulate Rajas and Tamo Gunas (psychological attributes) allowing disease to be established. G, Ajith Kumar et al. CONTEMPLATING THE RELEVANCE OF PRAJNAPARADHA AS A ROOT CAUSE OF MENTAL DISORDER. 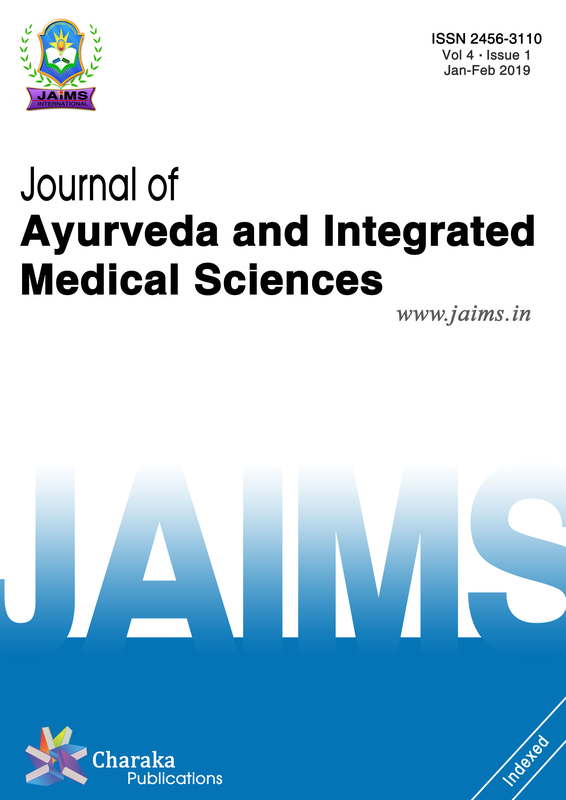 Journal of Ayurveda and Integrated Medical Sciences (ISSN 2456-3110), http://www.jaims.in/index.php/jaims/pages/view/Citation, v. 3, n. 4, p. 123 - 126, sep. 2018. ISSN 2456-3110. Available at: <https://jaims.in/index.php/jaims/article/view/613>. Date accessed: 25 apr. 2019. doi: https://doi.org/10.21760/jaims.v3i4.13295.